Manufacturer of stern tube seals and liners, net-protectors and zinc-anodes. Manufacturer of stern tube seals and liners, net protecters and zinc anodes. KEMEL play an important role in keeping oceans, rivers and lakes clean and ensuirng ships have safer voyages. Eagle Industry Co.Ltd, KEMEL Company are poised to provide the customers with a wide range of high quality products, engineered solutions and a quick response. They will take prompt action to meet the customers need by optimizing their high technology solutions and know-how. They strive to develop closer and more beneficial relationships with the customers. KEMEL is also one of the worlds leading marine sealing solutions and service providers comitted to safer voyages and a cleaner environment. The Compact Seal CX type and DX type is composed of three types of metal rings (flange ring, intermediate ring and cover ring), assembled by bolts. These metal rings form a casing and the seal rings are tightly fixed between metal rings. The metal rings are in contact with eachother which ensures that the compression of the seal rings is always maintained to the proper degree, preventing the risk of cracks occuring by excessive pressure on seal rings. These seal rings are all identical in design and normally and AFT seal is equipped with three seal rings and a FWD seal with two seal rings. The DX type is equipped with one more seal ring which works as a spare oil seal for emergency use. The compact seal gives excellent sealing performance, easy handling and stable quality over a long period of time, by utilizing the latest design technology and specially developed seal ring shape and material. The seal rings come in two kinds of materials - VITON (fluoric rubber) and NBR (nitrile butadiene rubber) for selection depending on the operating conditions of stern tube seal. The VITON seal ring fitted on the Compact seal has superb heat resistance, with a special fabric vulcanized on its surface to ensure high strength and durability. With its superior structure, the VITON seal rings features the important property of being free from the danger of crack generation under heavily loaded conditions. In case of any oil leakage from the #3 seal ring, the #3 seal ring is put into operation by closing two valves on the oil line between the #3 and #3S chamber. The #3S seal ring is safety serviceable for a long period thereafter. A chrome steel liner with superior abrasion and corrosion resistance. A special greade of high-chromium stainless steel is used for this liner. This new chrome steel liner is far superior to conventional chrome liners in its abrasion and corrosion resistance, and is highly effective when used as the AFT liner where pitting corrosion is liable to occour. The KEMEL chrome liners are provided with a sufficient machining allowance so that the worn-out liner can be repeatedly reused after grinding. The AX Type Air Seal has a simplified structure. Air, supplied from the air source within the ship passes through #2/3 chamber and is spouted into the sea water. Any change of draft is automatically detected by the air control unit and pressure is adjusted to maintain the optimum pressure on each part. * The provision of two seal rings on sea water side and stern tube oil side. Even if the oil seal rings are damaged the leaked oil is completely collected in an air chamber between seal rings. Any draft change is automatically detected and the stern tube pressure changes in accordance with draft changes even on vessels with numerous draft changes due to loading conditions. Air is supplied to the #2/3 chamber controlling the chamber pressure with a small amount of air constantly flowing out the drain tank to avoid deposition in the line. Total air consumption is less than 40 Nl/min. Emergency measures include spare seal rings and air control devices. It is possible to convert from air seal system to Double Security Type compact Seals with simple valve operations, provided that an emergency stern tube gravity tank is prepared. A compact, high performance water lubricated seal having excellent vibration resistance and sealing performance. Excellent sealing performance with shaft vibration resistance. Since it is an end face type seal consisting of the seal ring and the mating ring, it flexibly copes with complicated vibration and shaft deflection and shows excellent sealing performance. The seal ring rotates together with the shaft sleeve and therefore, there is no wear of the shaft sleeve. "Eagle Paint" is provided on the surface of the shaft sleeve to prevent corrosion. The seal ring and the inflatable ring can easily be bonded over the shaft by using the vulcanizer. By working the inflatable ring, inspection and replacement of the seal ring on the sea can easily be done. 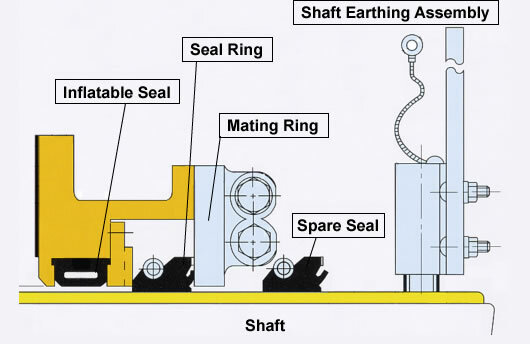 The sealing surface of the seal ring and the mating ring are lubricated by sea water coming through the notches of the seal ring, and therefore daily maintenance will not be required. Excellent durability and vibration absorption. Combination of advantages of reinforeced plastic with those of elastomer. The outer shell is made of reinforced plastic formed with glass cloth or cotton cloth and the sliding face is made of elastomer. Therefore, it is of high adhesive property, excellent corrosion resistance and light weight. Outstanding durability and stable performance. Shaft load is balanced by high elasticity of rubber and increased coverage area to avoid concentraded loan in the aft end. With the unique features of rubber, the EVR absorbs shaft vibration and prevents premature wear down of components. Since the construction materials are non-conducting, EVR bearing cuts the corrosive electric current from the shaft sleeve and prevents the shaft sleeve surface from getting rough. The outer shell is made of cotton cloth reinforced plastic (CRP) which is impregnated by thermosetting resign. It is suitable to be installed in ships with relatively small diameters. The outer shell is made of glass cloth reinforced plastic (GRP) and is suitable for relatively larger diameter. Cooling water is required for prevention of aging and fatigue on the bearing due to heat build up. During the shaft rotation, it is recommended to cool the bearing to the normal temperature as shown in the table below. Do not rotate the shaft without supplying water. Oil lubricating sterntube bushes have been manufactured in conjunction with KEMEL COMPACT seals for decades. The KEMEL standard bush is cast iron lined with white metal and the excellent reliability and performance have gained a high reputation. The standard materials of back metal are cast iton (FC250). The standard lining material is WJ2. 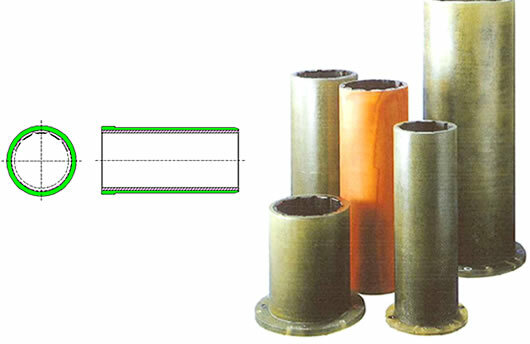 The sterntube bushes are supplied rough turned (margin 3mm) on the outside and finish machined on the others. In general, the following inspections are carried out: material test of back metal, water pressure test (0,2MPa), dimenison inspection, surface inspection and coherence test of lined material. Edge modification on torque rich propeller for lightening propeller rpm. Future Pipe, a global leader in anti corrosive fiberglass pipe system design, manufacturer and supplier of GRE to the marine sector. Supplies glassfiber Reinforced Epoxy Pipe Systems (GRE) onboard ships. Project Partner Marine Parts (PP MARINE) - Supplier of spareparts for main- and auxiliary engines, compressors etc. CSR is a rust & scale removing agent and corrosion inhibitor, developed specifically for the treatment and protection of BALLAST TANKS, including the life extension of epoxy coated tanks where coating breakdown is beginning to occur. Worldwide turbocharger supplier of spareparts and service suitable for MAN, MET, Abb and PBS turbochargers. Head office is in Southampton, UK. Authorized service stations and workshops for the MHI turbocharges. Service facilities in Rotterdam, Houston, Hong Kong, Shanghai and Dubai.